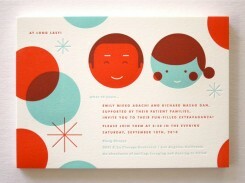 How adorable, gorgeous and fun are these wedding invitations? Created by graphic designer and illustrator, Erin Jang, these custom-made wedding invitations are some of the most quirky, but nice, wedding invitations I’ve seen. The level of detailing from the inside of the envelope to the menu card is what really caught my eye when I saw these designs. 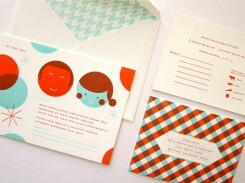 See more images of these wedding invitations at her site. Have I missed something?! Are you getting married Jaina?! Ha! No – nothing like that. Just one of the many things that popped up on a site i go to and thought these were a lovely bit of design! I LOVE those! I’m such a fan of the mildy vintage, early 60s pop art look to a lot of more modern designs these days. Granted, I don’t get my great 1930s/1940s itch scratched (people, for some reason, enjoy irritating me by stick to the 50s and 60s) but they’re cute as hell anyway! I’d love to be able to break out of my box and try something like this one day. Vintagey stuff just looks so much more interesting than modern designs these days. Though i bet if you took someone out of the 40s, they’d say the same thing about modern designs. Or would they? Out of the 40s? I doubt it. The WWII era would likely see us as very wasteful, but the post-war era would probably fall all over themselves trying to get a look at all our nifty stuff, lol. I’m actually a war-era home front enthusiast and a big vintage lover (my sister and I practice a vintage nouveau lifestyle, down to the dress of our respective eras) and when I started I didn’t know anything about the 1930s-early 1940s era that didn’t revolve around Shirley Temple films, lol. Every day almost since then I’ve managed to learn something new about the era’s everyday lifestyle. I wonder if there’s any need for 1930s style wedding invitations? They’re not kitschy like the pop art invitations (and other pop art styles that are so popular) but I bet having something like in a portfolio would definitely diversify it! It’s definitely not a bad idea! Least i don’t think so.